Disruptive technologies like “bring your own device“ (BYOD) and file synchronization have revolutionized the way we work. 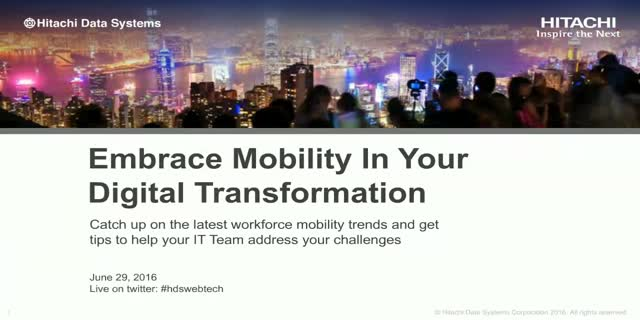 In the digital enterprise, your data must be as mobile as your workforce. As they move toward mobility, mature organizations are feeling the growing pains more acutely than their digital-native counterparts. But, those that make the choice to lead the change have the opportunity to redefine the way they work and create a more agile, more connected enterprise. Learn more about how to transform IT today so you can deliver solutions that drive better collaboration and productivity across your enterprise tomorrow. Join us for a live webcast on June 29, 2016, to hear Jeff Lundberg break down the latest trends, challenges and technologies to help make your data more mobile.